Just like earlier, hover your mouse over the 'paper, pencil and magnifying glass' icon so the popup below is shown. 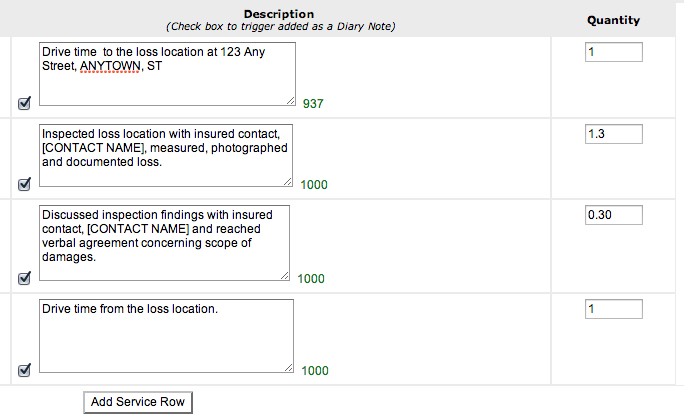 Then simply update the Amount of Claim box with your gross loss reserve and update the Date of Inspection if necessary. BILLING FOR INSPECTION, MILEAGE AND DRIVE TIME. 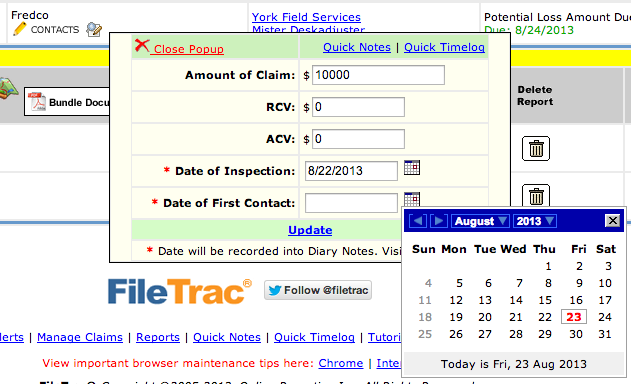 Remember, Time and Expense is to be entered daily, so it's very important to update the FileTrac Timelog while the inspection is fresh in your memory. Go back to the TimeLog for the file by clicking on the clock icon in FileTrac. 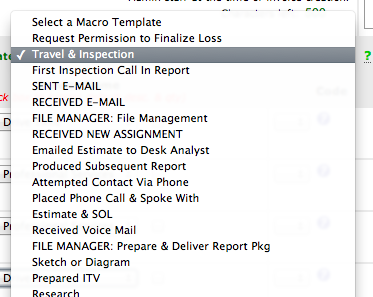 Choose the Travel & Inspection macro from the Macro Template drop-down list. This will automatically populate the activity description boxes once selected. As shown below, update any information in the activity descriptions in [brackets] and adjust the hours accordingly. 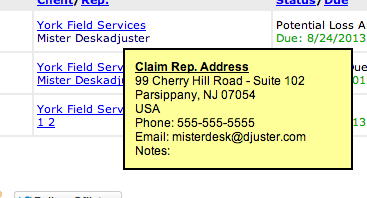 Don't forget to check the box to the left of the description to let FileTrac know that you would like this entry copied to the notes section. 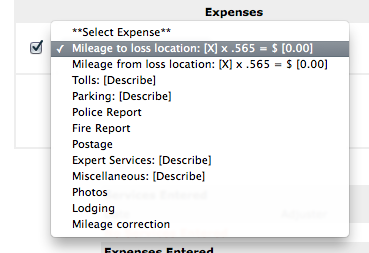 Next, add an expense row so you can enter your mileage. 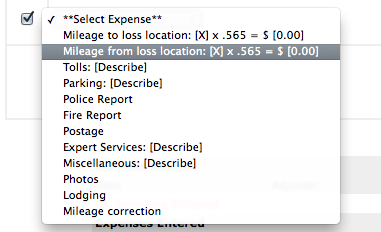 There are macros for mileage to and from the loss location, please make the appropriate selection. Fill in the mileage amount and total. Make sure you check the box to let us and the system know you would like to be paid for your mileage. It is very important to have periodic conversations with the York Desk Analyst to advise of any issues with the inspection, communications or just to keep them apprised of the status. Make sure that you bill for your communications and keep us updated with a note!